If you need another reminder that nothing can escape the all-seeing eye of the internet, this latest Friends find should do the trick. The folks at 22 Vision just released a video documenting a previously unthinkable connection between the long-running sitcom and 1990's Home Alone. 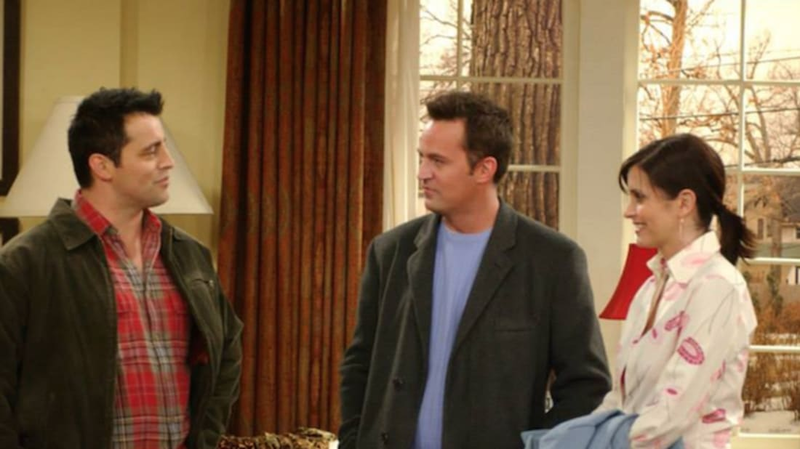 It turns out that Monica and Chandler may have bought the house owned by the McCallisters in the movie. How is that possible? With the help of some Hollywood trickery. The McCallister family lives in Chicago, while Monica and Chandler are seen purchasing a house in the suburbs of New York in the final season of the show. So they obviously don't live in the same on-screen house. However, the view of the neighborhood from inside Monica and Chandler's house reveals the same exact one seen from inside the McCallister residence in Home Alone, right down to the blue garage of the Murphys' house across the street. As the video points out, it seems that the folks behind Friends simply reused stock footage from Home Alone for the set of the Bings' new house. On the 22 Visions YouTube page, the channel even wrote, "This bizarre fact has been confirmed by the people who live in the Home Alone house in Winnetka, IL." TV shows and movies recycling certain bits of footage and sets is nothing new, but it's usually fairly well hidden or too obscure to be noticed. So to make a connection between Home Alone and an episode of Friends from 2004 simply by looking at a blue garage outside the window gives a whole new definition to the term eagle-eyed.